Well cared for, elegant nails give a great first impression, and it is often said that our health is mirrored in our nails. Research conducted by Vitabiotics found that women rated nails as their main beauty concern - more than either their skin or hair. So, if you feel your nails need to get into shape, you are certainly not alone! Perfectil Plus Nails has been developed for those with a particular interest in maintaining the health of their nails, as well as great all round support for skin and hair. With over 25 micronutrients specially chosen for their combined effect, Perfectil Plus Nails supports all the key areas of beauty; skin and hair, with extra support for nail health. Perfectil Plus Nails provides your skin, hair and nails with a comprehensive spectrum of the essential bio-active nutrients. As well as benefiting these areas, Perfectil Plus Nails also safeguards your diet by doubling up as a complete multivitamin for all round health. There is no need to take an additional multivitamin. 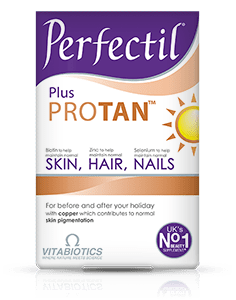 Perfectil Plus Nails is available in the UK from Boots, Superdrug, Tesco, supermarkets and pharmacies, health stores including Holland & Barrett. Alternatively order online here. Advanced Micronutrient, vitamin and mineral tablets with Horsetail Botanical extract, MSM, Co-Q10, amino acids and Grape Seed extract to help maintain skin, hair and nails. Calcium Carbonate, Bulking Agents: Dibasic Calcium Phosphate & Microcrystalline Cellulose, Methyl Sulphonyl Methane, Tablet Coating (Hydroxypropylmethylcellulose, Propylene Glycol, Ethyl Cellulose, Purified Talc, Natural Source Colours: [Titanium Dioxide, Iron Oxides]), Magnesium Oxide, Vitamin C (Ascorbic Acid [Carrier: Hydroxypropylmethylcellulose]), Anti-Caking Agents: Stearic Acid, Purified Talc, Silicon Dioxide & Magnesium Stearate, Polyvinylpyrrolidone, Pantothenic Acid (as Calcium Salt), Vitamin E (D-Alpha Tocopheryl Acid Succinate) (from Soya), Potato Starch, L-Cysteine, Citrus Bioflavonoids, Ferrous Fumarate, Zinc Sulphate, Hydroxypropylcellulose, Horsetail Powder Extract, L-Methionine, Niacin (Nicotinamide), Crosslinked Cellulose Gum, Polyvinylpolypyrrolidone, Grape Seed Extract, Thiamin (Vitamin B1 as Mononitrate), Vitamin B6 (Pyridoxine HCl), Betacarotene (Starch, Water, Antioxidant: DL-Alpha Tocopherol), Vitamin D3 (Cholecalciferol [Carriers: Medium Chain Triglycerides, Colloidal Silicon Dioxide, Purified Talc, Maltodextrin, Butylated Hydroxyanisole, Ethylcellulose]), Manganese Sulphate, Vitamin B12 (Cyanocobalamin), Co-Enzyme Q10, Riboflavin, Copper Sulphate, Folic Acid (as Pteroylmonoglutamic Acid), Sodium Selenate, Potassium Iodide, Chromium Trichloride, Biotin. Allergy Advice: For allergens, see ingredients in bold. TWO TABLETS PER DAY WITH YOUR MAIN MEAL. Swallow with water or a cold drink. Not to be chewed. Do not exceed the recommended intake. Perfectil Plus Nails should only be taken on a full stomach. A general multivitamin is not necessary in addition to Perfectil Plus Nails. May be used for as long as required. A regular intake is recommended. As with other food supplements, , consult your doctor or pharmacist before using if you are under medical supervision, pregnant, breast-feeding, have epilepsy, a thyroid condition, haemochromatosis, or suffer from food allergies or are allergic to any of the ingredients. Not suitable for children. This product contains iron, which if taken in excess, may be harmful to very young children. Food supplements must not replace a varied and balanced diet and a healthy lifestyle. Store below 25°C in a dry place, out of sight and reach of children. Why has Perfectil Plus Nails been developed? Who should use Perfectil Plus Nails? Can Perfectil Plus Nails be used during pregnancy and breast-feeding? Can Perfectil Plus Nails be taken simultaneously with medicines? How many tablets does one pack of Perfectil Plus Nails contain? How and when should Perfectil Plus Nails be used? What happens if I forget to take my Perfectil Plus Nails tablets and miss a day? 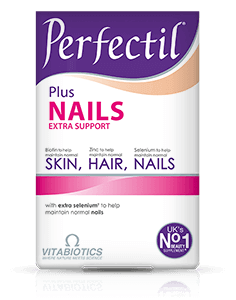 Are there any undesired effects whilst taking Perfectil Plus Nails? How long does it take to experience any benefits in the condition of the skin, hair and nails? Perfectil Plus Nails formula has been developed for those who want to maintain the health of their skin and hair, but have a particular interest in maintaining their nail health and wish to give this aspect extra support. Key nutrients include selenium, botanical Horsetail Extract, a natural source of silica, Methyl Sulphonyl Methane (MSM) and amino acids. "I love Perfectil, I started taking perfectil vitamins 4 years ago, can’t live without it! My hair, my skin and my nails loves it! I recommended it to all my friends, colleagues, family and relatives! " "I have been using these around 3 weeks now and it has done amazing things not just to my hair but my skin and nails are looking amazing, skin looks radiant and nails growing and much stronger...will continue to take them for sure!" "I have been using Perfect 7Prime Woman 50+ for a long time but 2 months ago I stumbled Perfectil Original Skin, Hair, Nails. My nails have always been horrendous, flacking, cracking, bending etc. I am now on my 3rd month taking these and OMG really cannot believe it, my nails have grown, no flaking, much stronger, I am so thrilled that I can be proud to show my hands now. I just had to write to thank you." "Hi. I have been using Perfectil Plus Hair for a year. I LOVE THE DIFFERENCE IT HAS MADE TO MY FINE BALDING HAIR. Thank you for this amazing product. I will always use this product now as my hair is so strong and different. Thank you." "I was resistant at the beginning, but here I am after a week I can really feel a change in my skin glowing. Thank you. " "I am so grateful. ... 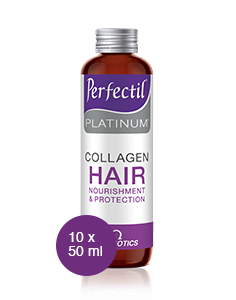 I have been on Perfectil now for a month for hair and my hair is no longer falling out and its coming thick, shiny, bouncy, I just want to say with a smile, thank you! Thank you! Try it please, it works!" "I have been taking Perfectil Original since l turned 40. I am now 71 and people remark that l not look my age.l therefore have to put this down to your product as my hair, skin and nails are perfect.Thank you"
"My hair was in a pretty bad state before I started using the Original Perfectil Skin, Hair & Nails tablets. I can honestly say it has worked for me. I’m at the end of my first pack and I can feel a huge difference. my hair feels like it has thickened and I haven't had any breakage while washing my hair which was happening alot before hand. I’m never one to write reviews but felt this one was worth it. I'm very happy that I came across this product and will be continuing to use it!" "This product is really good for me. Thank you very much Perfectil." "My friends have noticed the change to my hair condition since it was damaged by a bad hairdresser who completely burned it doing highlights. It took me three years to recover it and it would never be possible without Perfectil." "I went to my hairdresser a couple of weeks ago and when he was done he was filled with self praise. He thought that he had the magic touch because he had never done my hair so well before. I didn't have the heart to tell him that it was the effect of using Perfectil. My hair is so shiny and it's getting so thick already. Skin is still glowing and my nails have been growing like weeds. All this after being on these products for only 8 weeks. I will always be a customer." Love u Perfectil. Thanks a lot Vitabiotics. "I have been using Perfectil Original for the last few months and I felt compelled to email you to congratulate you on such a wonderful product. In the past I have used a number of well known products, (which also were far more expensive than your product) and they have NOT worked for me. I am so glad that your product does work for me. Thank you again"
"I am writing to tell you how much I adore your "Perfectil" range of products. My nails have gone from stumpy and frail, to long and strong!!! I haven't seen a difference in hair length, however it has become thicker and more shiny. ...have improved my skin so much!!! All I can say is "well done"!! As a feel good enthusiast, I have recommend all your products to my friends and family. Thank you." "I've been using Perfectil since last summer and I have to say I am obsessed with it! I got the one that helps that little big extra with hair growth and it made a huge difference! I used to have such thin hair and it wouldn't grow for me until u started using Perfectil! I have told all my friends about it because they noticed such a huge difference!" "I started shedding my hair very badly. After taking this hair fall is under control. My skin is glowing and my nails are very pretty. I have got the stock for another 4 months. Thanks Perfectil.. Beauty of Secret." "A shop assistant in Boots Chemists told me about Perfectil about 10 years ago after I admired her hair. I started taking Perfectil and my hair was the healthiest it's ever been and people often commented on how shiny it was! I say was, because I decided to go back to being a blond a few months ago, and as was expected, my hair is now weakened and damaged because of the bleaching process. I am going to start taking Perfectil again to hopefully get my hair back into a healthy, shiny state and, hopefully, grow it back to its former length. Thank you so much for your wonderful product Perfectil. I have extolled its virtues to everyone who has ever stopped me in the street, supermarket, etc. admiring my shiny locks." "I just wanted to take the time to send you some feedback on one of your products that I have been using (skin, hair, nails). I have been using this product for 2 months and I can already see a difference in my skin. My skin looks revitalised, I have even received compliments from friends. Your product has literally given me a new found confidence in my appearance, thank you"
"I have only been taking this product for three weeks now but I have already begun to see a marked improvement in my nails, hair, and skin. I will continue to use this product. Thanks Perfectil !" "These tablets are miracle.. i only used them for 10 days i can see the difference already. thanks for Perfectil." "I am very impressed with this product. I am 56 years old and have never been able to grow my nails. I have been taking Perfectil for 2 months and now my nails are strong and lovely. As a bonus my hair and skin are in the best condition they have ever been. I will keep on using this product in the future. Thank you"
"Hi, I just wanted to say how happy I am with Perfectil. I started taking them almost 2 years ago when I suffered from hair loss. I had tried everything else without success, but within 3 months of taking Perfectil triple active my hair was growing back. It is now back to normal but I don’t think I’ll ever stop taking them, my general health has improved and I’m pretty sure its down to Perfectil. thank you so much for this wonderful product. I work in the beauty industry and I often meet ladies who are going through problems with hair loss and I tell them all to use this product. It genuinely works. Thank you." "After taking Perfectil Platinum for 2 weeks I can honestly say my skin is positively looking 100% improved and looks so smooth and amazing. It is great to wake up every day and see my skin is even more glowing and fresh." "For more than 3 years, I have been purchasing Vitabiotics healthcare supplements for myself and my family. Two months ago, I tried Perfectil Platinum. Results are amazing. 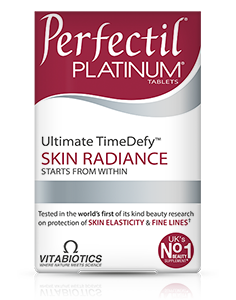 Perfectil Platinum has helped me maintain skin radiance and elasticity despite huge lose of weight! Thank you, Vitabiotics!" "Perfectil is an amazing product which I have been using for more than 10 years and I can truly say that this is a miracle in a box! It does exactly what it says on the box and the results are that it’s taken years off my real age." "I've been using Perfectil for just two weeks and my skin is almost perfect. Thank you for this product!" "I cannot believe what a difference Perfectil has made in such a short space of time! My nails are long and strong and my hair is in really good condition. Perfectil was recommended to me by my hairdresser - and I've recommended it to all my friends!" "I have been taking Perfectil for the past 2 weeks and i can't imagine the change in my skin. I'm so happy - thanks to Vitabiotics!" "I started using this product on 29th December 2009 and today, 16th March I've noticed a difference in my skin and nails! My nails are the longest they have ever been in years (last time was during my pregnancy ten years ago!) Thank you"
"I have been using Perfectil for 30 days. I can't believe how clear and healthy looking my skin is. What a difference i am recommending this product to all my friends!" "I have only been using Perfectil for one and a half months!! What a difference to my hair, skin & nails in such a short time. Just a brilliant product. Pity I didn't start using it earlier. A must!!" "I have been taking Perfectil for 11 months now and the change in my skin is amazing. Since 15 (now 34!) I had tried everything. I saw these and got some and have never looked back. My nails are also growing, without breaking, for the first time ever and my hair is better too. I would recommend these to anybody. I have skin confidence for the first time in a long time :-) I have now started taking Perfectil Plus, as I'm getting older, due to the content of EFA's and Omega oils, something which my diet lacks. So hopefully I'll look even better!!! Thank God for these vitamins!" "I have been using Perfectil for the last 3 years and the results are amazing. Since using Perfectil, my skin is completely clear. I do not even need to use foundation or powder." "I am writing to say thanks. My skin has always been nice and shiny but my hair has been a real disaster after having my first child. I have been using Perfectil for 4 months and it had an amazing effect on my hairs and nails. I am very happy that I have chosen to be a Perfectil customer." "I have been using Perfectil for 2 months now and have seen a very big difference in my skin and especially my hair. Since using Perfectil, my complexion has become flawless. My hair was also very brittle, it is now so thick and grows so fast, even my hairdresser has commented on how strong my hair has become." "Hello, I just had to write this email to tell you how wonderful Perfectil is. I have to take very strong medication and for a long time I was losing a lot of my hair, I tried everything from pills to specialist shampoo, spent a small fortune and had no results. Then spotted your product and tried it for a few months and my hair is fuller and healthier than before. I just wanted to say this product is a miracle for me and I will always continue to take it." "I have been using Perfectil for the last 2 months. I am impressed that my nails and skin are much better. I am also going to the gym 3 times a week but I have never seen such a radiant glow on my skin. My hair is very brittle and dry but it is getting better. I hope it will help my hair as well. I will be taking these tablets for a very long time." "Just like to say a big thank you to Perfectil. I have suffered from hair loss at the age of 24 so i started to use Perfectil. My hair looks more healthy and has a healthy shine. Many thanks again." "First time I have purchased Perfectil but I am most impressed with the outcome. After 1 week I can see a marked difference in my nails. Thank you." "I wrote to you before about your wonderful hair and nail vitamins. Well I have taken them for about 6 months and my nails are wonderful, almost can’t keep up with them they were so weak before. My nails have never been so good, they are long and hard and need constant filing!" 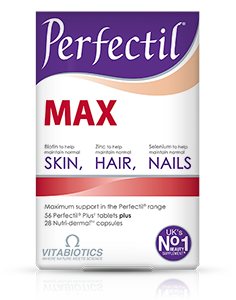 "I am writing to tell you how wonderful your Perfectil hair & nail tablets have been for me. My hair has completely changed and is now much thicker and I am now taking them everyday and so very pleased- thank you so much." "I first started taking Perfectil about a year and a half ago and couldn't believe the results. The appearance of my skin, hair and nails improved within a few weeks. Thanks"
"I am going through the menopause at the age of 45 and have been for the last 2/3 years. It was suggested to me that I should start to take Perfectil for skin hair and nails. I am on my 2nd pack of 30 tablets and I have noticed an improvement in the thickness of my hair." "I felt I must write to tell you how brilliant your product Perfectil is. I have been taking Perfectil for about four months now and have seen so much difference in my hair and nails. My nails were very brittle and would not grow. Also my hair was quite fine. Since taking the tablets I have seen a big difference. My hair seems to have become thicker, growing lovely and my nails, although not quite talons, are growing beautifully." "Perfectil has really worked well for me. My hair was brittle and always breaking because in the winter, I normally keep it in plates and this can take its toll on my hair. But since I started taking Perfectil, my hair has improved dramatically and is stronger and has a healthy shine. It has also helped my nails to grow and my skin has a wonderful glow which my friends and partner have all commented on. I'd recommend it to anyone!!!!!" "I have been using Perfectil for 1 month and I am so happy that it really helped the quality of my hair. I was having problem of hairloss. My hair looks healthy.Thank you very much PERFECTIL. " "During the past couple of years, my skin has not been what it used to be. I decided to try Perfectil a week ago, and the differences made to my skin were almost instant. I feel much happier now. My hair is also in a lot better condition, so thanks!" "I tried many products but no luck. Some Skin Specialist advised to take PERFECTIL. A lot of Thanks to PERFECTIL. " "Bought this product after having a nasty experience with a dodgy nail bar which ruined my nails, after using them for 4 weeks I can already notice the difference, my nails are growing and are getting back their strength, not to mention my hair feels thicker and is always shiny and my skin hasn't had the usual monthly break out when my period is due - its magic - thanks Perfectil"
"I have a history of very sensitive skin. I took Perfectil some time ago and felt that my skin was very healthy at that point although I could not believe that Perfectil was the main reason...I then stopped and restarted 3 weeks ago, and I can honestly say the results are amazing .."
"I recently started taking Perfectil. It has really done a great job. My skin & nails look much better. Keep up your good job. " "I have been taking Perfectil for around 6 months now. A while back I saw a magazine advertising Perfectil and it said all the supermodels were taking, so I though its got to be half decent. I never noticed much improvement for about a month apart from my nails were slight stronger, but as all beauty treatments, I thought you should use them for 3 months to notice the difference. After 3 months there were improvements in my nails and skin, my hair was stronger too. Imagine all the improvements now I've been taking them for six months. For years I have been looking for creams, serums, strengtheners etc. to make me look better. We all take them, lets face it, we spend huge amounts of money on them, but Perfectil isn't a fancy cream and that is way better. I didn't think the tablets would help improve the way you look until I heard of Perfectil. Listen to one thing I've got to say, save your money and treat your self, don't get all these fancy things, just buy a box of Perfectil. It is an excellent product. Oh and one last thing, no it's not like taking medication." "I have an extremely busy lifestyle, I hardly have time to cleanse, tone and moisturise most of the time, never have a manicure to make my nails stronger as they are weak and don't use leave in conditioners. I was talking to a mate of mine a while back who has the same problem but she always looks well pampered and she was talking about Perfectil. That evening I went out and bought some, thinking I might give it a try but it might not work. I have been using Perfectils for around 3 and a half months now and the results are amazing. Everyone always asks me where I buy my face cream and nail strengthener from. Its not like taking medication or anything and I recommend it to everyone. They are really cheap compared to all these fancy products, plus you need to buy different types for all that Perfectil does. If you have the same problem as me buy some and if you haven't still buy some. You will be screaming with joy at the difference... "
"Dear Spirit, (Superdrug magazine) At long last I have the lovely-looking, just manicured nails that I’ve always dreamed of. Thanks to your article and promotion in the Nov/December issue. I think it was in ‘Spirit loves’. I’ve always had horrible short nails, as I just couldn’t stop biting them, and they would never grow. Even my skin and complexion is bright and clear. Also, I don’t have to worry about taking specific vitamins and minerals, this wonder product helps maintain healthy skin, hair and nails plus it has all the vitamins you can think of. You mentioned that if you start now, by the summer you will have something to smile about but I have the proof already after 3 ½ months. So I’d like to say THANKS FOR RECOMMENDING PERFECTIL!!! I don’t know what I’d do without it! Cheers, Ms S M, London. PS- keep up the good work. " "I was very keen on trying out various health supplements but never seemed to notice any benefit, so I stopped taking them. I was a little dubious about trying yet 'another' product but as I felt low and was looking old for my age, I eventually decided to try your Menopace and Perfectil tablets. I am so glad I did, because after only 3 weeks I started to feel so much happier and more energetic. After 10 weeks everyone says I look ten years younger! Can this really be due to your tablets? I will only know the answer if I stop taking them but I am not taking the chance! There is only one person who thinks more highly of your products than I do and that is my husband! " "Hi. I am really pleased with the product Perfectil." "“I am now 65 and my skin is very good; I have a good head of hair, and I am always being complimented on my nails which are long, strong and look terrific. Needless to say this is due to taking Perfectil, so I recommend everyone to take them. I am.” "
"I am 16 and have recently started taking one of your range of vitamin products, PERFECTIL, and I just wanted to say how good they are! In the short time I have been taking them, I have noticed a dramatic improvement in the state of my nails, and my skin and hair also seem healthier. I have had great trouble in the past with weak hair and nails, and poor skin condition, so I wanted to thank you very much for how much your product has helped me. I am very grateful to you for making this possible, and I would recommend this product to anyone. Thank you again. " "Dear Vitabiotics, About two years ago, my nails started to split, tear and were really unsightly. I tried many different very expensive creams to no avail, then about a year ago I found Perfectil in Superdrug. After taking Perfectil for only 6 weeks, my nails started to grow much stronger, and stopped splitting and breaking. Needless to say, I am thrilled to bits with the result, and I don’t think a day goes by without someone commenting on my nails, and asking how I managed to get them to grow as long, and strong as they are. I am sure your sales of Perfectil must have increased in the last 6 months or so, as I have recommended it to so many people - Sales assistants, friends and family. By the way, my hair and skin isn’t too bad either - considering I am over 60!! " 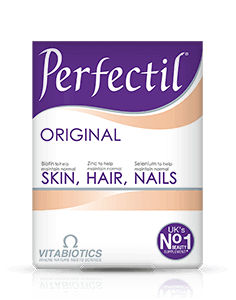 "Dear Vitabiotics, I have been meaning to write to you for a couple of months but can put it off no longer as I really feel I have to congratulate you on your wonderful product PERFECTIL. I started taking these tablets about six months ago and now wouldn’t do without them. I am 56 yrs old. I decided to try Perfectil and I have to say, skin is pink and soft again, longest nails I’ve ever had and my hair is thick like it used to be. I can only put this down to these ‘great little pills’. Please,please don’t stop making them and take them off the market. This is the first letter I’ve ever written to a company about this product so you can see that’s a fair reflection on how I feel. Great! Your Satisfied Customer, "
Always see pack before use for full information and directions. Do not exceed the recommended intake. As with other food supplements seek professional advice before using if you suffer from food allergies, and consult your doctor or pharmacist if your have an underlying medical condition, or if on medication. Do not take if you are allergic to soya products. This product contains iron, which if taken in excess may be harmful to young children. Vitamin supplements are not intended to treat or prevent any disease. Food supplements must not replace a balanced and varied diet, and a healthy lifestyle.